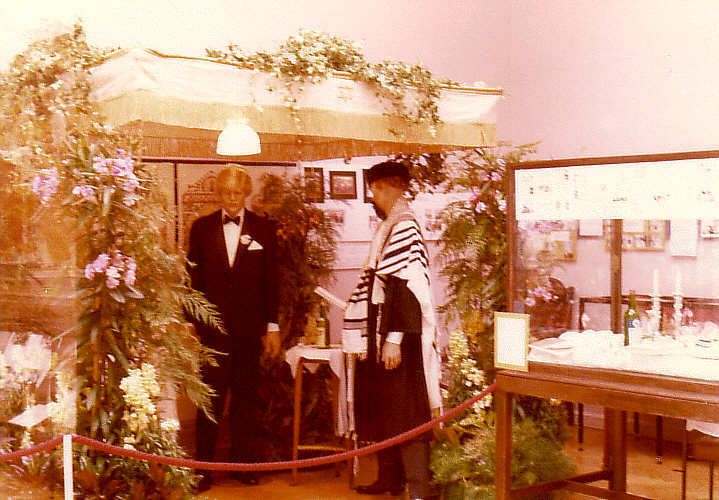 In 1980, I made two visits to the Russell-Coates Museum in Bournemouth. 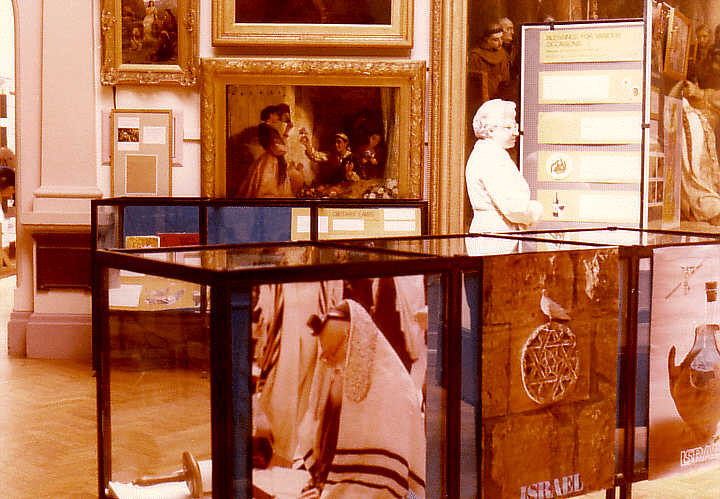 This museum had a "Jewish Way of Life" Exhibition organized by Mrs. Ruth Winston-Fox. The two pictures on this page were taken on that first visit to the museum. (Russell-Cotes is just up the hill from the Royal Bath Hotel, at the start of East Overcliff Drive.) Unfortunately, I ran out of film and was unable to take anymore pictures during that visit. Thus, I had the desire to pay a second visit to the exhibit in order to take more pictures. At the same time, Mr. Cyril Galkoff, a Warden of the Bournemouth Hebrew Congregation and chairman of the Exhibition Committee, asked me for a favour in the form of producing a catalog of pictures to help Mrs. Winston-Fox set up the exhibit at other venues around the country. Thus, I made a second visit with Mr. Galkoff and Rabbi Indech. Two rolls of 36 print film were used on this project to capture the entire exhibit - every display cabinet and close-ups of many items. The films were processed overnight with two sets of prints made (if my memory is correct) and handed to Mr Galkoff with the understanding that I would get the negatives back at a later date - that turned out to be a mistake. Unfortunately, Mr. Galkoff and my late father were not successful in getting the negatives (or a set of prints) returned, which is why I don't have this large collection of images to display here. Now over 23 years later, if any of Mrs. Winston-Fox's family should come across this page and know where the prints or negatives are located, and can return them to me, I would very much appreciate getting them back. I will then place the images here. It's a long shot - but I have to ask.